DENVER, March 18, 2019 /PRNewswire/ --Spectralink, a leader in enterprise mobile solutions, today announced it has received three prestigious 2019 Mobile Star Awards™, including Innovative Business Smartphone for the Versity Android device, Healthcare Mobile Innovation for Versity, and Mobile Development Innovator honoring Spectralink's Vice President of Product Management and Technology Solutions, Andrew Duncan. The awards program is hosted by the MobileVillage.com. "We are excited and honored to receive three Mobile Star Awards for our innovative enterprise mobility solution that is helping organizations worldwide transform their mobile and digital strategies," said Duncan. "The recognitions are a testament to the hard work of our engineers, and we thank them for their ability to push past the industry norms and provide industry-leading innovations." The Versity enterprise smartphone offers next-generation, enterprise-grade support for mission critical workloads in industries such as healthcare, hospitality, manufacturing and retail. The powerful, hand-held communications solution delivers secure and reliable data access and enhanced connectivity to improve workflow efficiency, team coordination and customer care. 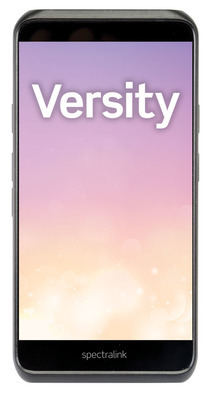 Engineered to support today's mobile workforces with a sleek, consumer-like smartphone design, Versity is easily operated, has multi-shift functionality, includes a 5.2-inch, full HD display, and offers superior text and image clarity even in low light conditions. "Even after 25 years of promoting the best in mobile, we're always excited to shine a spotlight on the newest mobile tech innovators — both creative new app startups and older, powerhouse companies," says MobileVillage Editor Gary Thayer. "Most MobileVillage readers and social followers have years of experience with mobile apps and gadgets, so we trust them in helping to name the year's best mobile apps and companies." "Winning a Mobile Star Award is an accomplishment that's recognized by the entire mobile industry, as well customers and buyers," says MobileVillage Founder and CEO Jon Covington. "Mobile Star Awards Winners truly shine among millions of other mobile products as the greatest stars out there." To learn more about Spectralink, please visit www.spectralink.com. Since its founding in 1993 as PDA Inc., MobileVillage® has led in promoting innovative, user-focused mobile technology around the world. The company fosters mobile alliances, product development and excitement through its popular Mobile Star Awards™ program, the world's most extensive mobile events calendar, directory, feature stories, event partnerships and consulting. Spectralink leads the enterprise mobility market with the industry's most deployed mobility solution portfolio optimized for mission-critical healthcare, retail, manufacturing and hospitality applications. As enterprises transition to mobile workflows, Spectralink is at the forefront of the industry transformation through its innovative end-to-end mobility portfolio. Designed for challenging RF environments, our mobile solutions enable enterprises to streamline their workflows and deliver a positive customer experience. To protect our customers' investments in UC platforms, we offer the best interoperability in the industry with the leading call control platforms. Since 1990, Spectralink has deployed millions of mobile devices worldwide – providing enterprises with the industry's most reliable, high quality and secure mobility solutions. For more information, please visit www.spectralink.com.